The total defeat suffered by the Pacific fleet, then the entire baltic fleet in the hands of the Japanese in 1905 not only durably harmed the regime’s authority outside but weakened it inside as shown by the Potemkine mutiny and popular bread walks suppressed by force. This will re-emerge in 1917 and bring the Romanov dynasty to its knees. 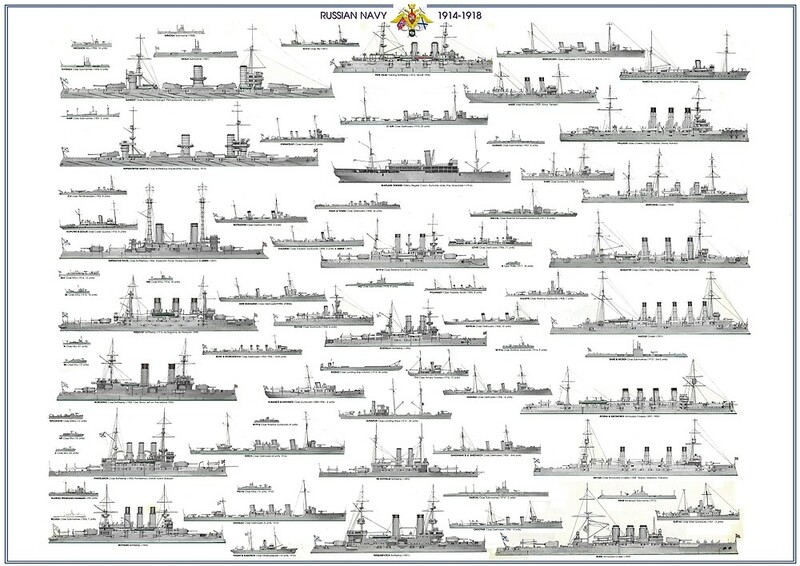 For the Navy, lessons had been learnt, and when designing the next pre-dreadnought, still on the basis of the Potemkine class (1903) but larger and with many modifications that much delayed their completion to 1911. By then they were hopelessly outmatched and stayed in the black fleet, facing the Turkish navy as possible opponent and their career was relatively short, as both has been scrapped in 1922, barely after ten years of service. The previous Potemkine class, on which the following design was largely based. 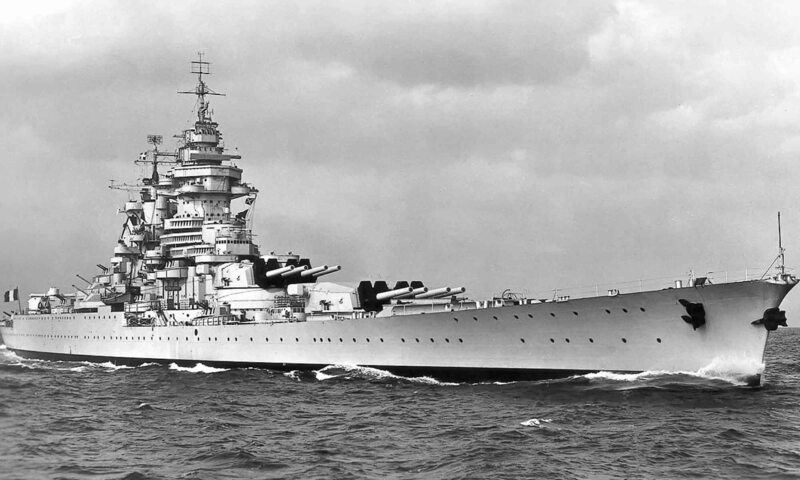 As such, these battleships not only capitalized on the Potemkine design, but many aspects were studied with caution. They displaced 12,738 long tons (12,942 t), versus 12,480 long tons (12,680 t). In reality they were 45 tons lighter. They were slightly larger, 385 ft 9 in (117.6 m) instead of 378 ft 6 in (115.4 m), a bit wider at 74 ft (22.6 m) vs. 73 ft (22.3 m), however their engines were essentially the same and top speed about 16 knots (30 km/h; 18 mph), unchanged. 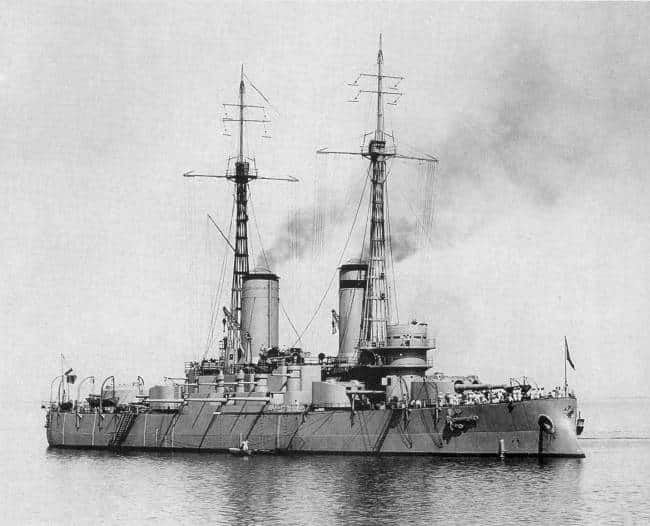 Despite being late in the game, the Evstafi class was not the last one, strangely, it was indeed superseded by the next Andrei Pervozvanny-class battleship, which were completely designed from the bottom-up with the 1905 lessons at heart and probably among the most powerful and capable pre-dreadnoughts worldwide ever designed. The next Andrei Pervozvanni class was much larger and hybridated with dreadnoughts features, namely greater speed and much powerful armament. These were designed since the beginning to integrate 1905′ battles lessons, while the Esvstafi has been modified so after launched. In armament however, they received an additional four 6in secondary guns (203 mm) in addition to their main artillery of 152 mm, slightly reduced from 16 to 12 cannons to compensate. The main artillery comprised two pairs of 12-inch 40-calibre Pattern 1895. Each had a 260 degrees traverse, +35/-5° elevation can fire at 4 rpm, with 75 shells in storage. The 331.7 kg shells can find their mark at 20 km (22,200 yards). The brand new 8-inch (203 mm) 50-calibre Pattern 1905 guns were mounted in armoured casemates fore and aft, each with a 120° traverse, and 20° elevation. The HE shells weighted 264.3 pounds (119.9 kg), travelled at 2,647 ft/s (807 m/s) and found their mark at 14 km (15,800 yds), with 110 more in storage for each artillery piece. 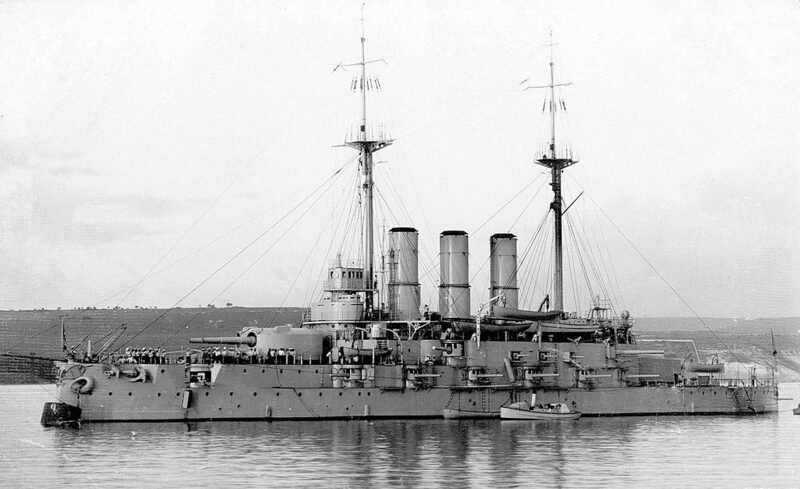 Evstafi at anchor, black sea fleet, prewar. The secondary armament also comprised a traditional set of 6 in (152 mm) pieces in lower casemates, 12 Canet Pattern 1892 45-calibre guns in all. With a 20° elevation, these 91 pounds (41 kgs) shells had a maximum range of about 7 km, with a rate of fire of up to 15 rpm with a well-trained crew. The tertiary artillery meant to deal with TBs comprised fourteen 75-millimetre (3.0 in) guns Canet Pattern 1892, versus 14 × 75 mm M1892 Canet guns and six 47 mm (1.9 in)/40 Hotchkiss guns on the Potemkine. For close encounters, the ship was given the same two single 17.7-inch (450 mm) torpedo tubes on the broadside. Each travelled at 29 or 34 knots at about 2000 or 3000 m depending on the speed selected, and carried to the target a 212 pound (96 kg) warhead of TNT. 2 shafts propelled by 2 Vertical triple expansion steam engines, fed by 22 coal-fired Belleville water-tube boilers. Top speed was 16 knots (30 km/h; 18 mph) and range 2,100 nmi (3,900 km; 2,400 mi) at 10 knots (19 km/h; 12 mph). By comparison the next class would be able to reach 18 knots. The boilers operated at 242 psi (1,669 kPa; 17 kgf/cm2). On trials, the ships reached 10,800 ihp (8,100 kW) for a top speed of 16.2 knots (18.6 mph). They carried 1,100 long tons (1,100 t) of coal. Both ships were given a reviewed protection, with German Krupp armour which had a max. thickness (belt) of 9 inches (229 mm) down to 3 inches on the underwater ends and decks. The upper belt was 3.1 to 5 in (79–127 mm) in thickness, the Casemates 3.1 to 5 in (79–127 mm), the conning tower 8 in (203 mm), while the Main turrets were protected by 8 to 10 in (203–254 mm) and main barbettes by 4 to 5 in (102–127 mm). The Evstafi was laid down in 1904 and launched in 1906 at Nikolayev Admiralty Shipyard, Nikolayev and the Ioann Zlatoust Sevastopol Shipyard, Sevastopol at the same dates, but in May rather than November. However fitting out took years, whereas it’s usually much faster, as many design revisions accumulated as long as reports from the Russo-Japanese war bring new elements to consideration. One such modifications were the main and secondary gun’s elevation, suppression of three torpedo tubes, mine stowage and the 47 mm QF Hotchkiss guns. Protection at the waterline fore and aft of the main belt was enhanced greatly. Also a second conning tower was added at the rear, and the heavy masts were replaced by light pole masts and light booms for increased stability. 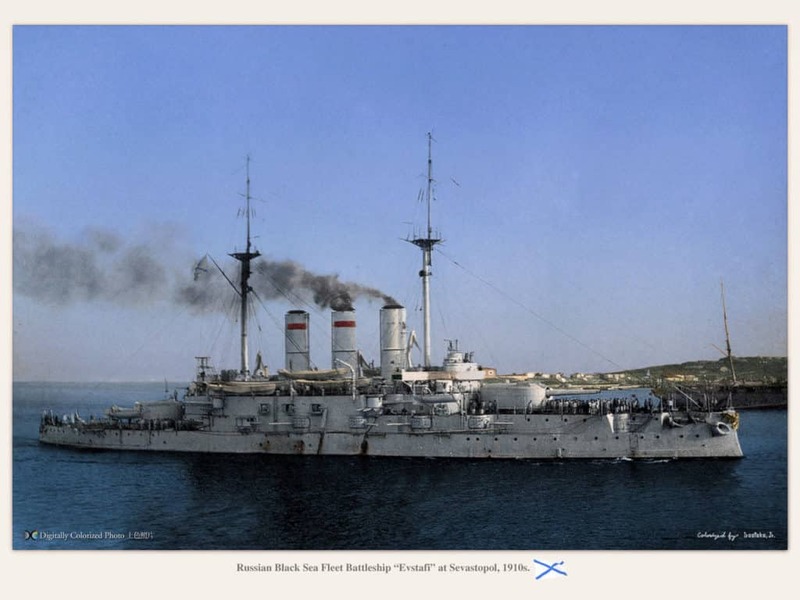 Both ships appeared as the most powerful battleships in service in Russia by 1911 and they joined the Black sea fleet as flagships; Famously the Evstafi was the Black Sea flagship, carrying Vice Admiral Andrei Eberhardt’s personal mark at the battle of Cape Sarytch. Before that, the fleet performed a shelling of Trebizond on 15 November and again on 17 November. They went hunting for Turkish shipping along the Anatolian coast but changed course and headed to Sevastopol when they intercepted on theyr way back the German battlecruiser Goeben and the light cruiser SMS Breslau. The battle was not an easy win as the fog prevented the ships in line to spot the enemy and the new Russian tactic using a “master ship”, there the Ioann Zlatoust to direct fire for the whole line, caused delays. Both the Evstafi and Goeben duelled at 4,000 yards (3,700 m), taking hits. The Evstafi was stuck in the middle funnel, destroying the antennae for the fire-control radio. This caused the battleship to not relay anymore accurate data (she was the lead ship) to Ioann Zlatoust, and from then on, had to rely on her proper data. As expected all the other ships included the master ship all fired inaccurately due to Ioann Zlatoust’s incorrect data, and the Goeben escaped disaster. Goeben hit Evstafi four more times before Admiral Souchon decided to break and head for Constantinople. Evstafi suffered 34 killed and 24 wounded, fired about 12-16 main shells, and 14 and 19 secondary battery shells. Figures were about the same for the Ioann Zlatoust were lower, with just six shells fired and no hit. So the battle was seen afterwards like a draw. The two next years of the war, the ships went partly inactive, but for exercizes, however from march to May, both sister ships and the fleet performed bombardments on the Turkish forts and installation of the Bosphorus. In May, 9, Turkish destroyer Numune-i Hamiyet spotted the ships, alerting the Goeben that quickly rallied; Both forces spotted each other from afar and set parralel courses but duelled at 17,400 yards (15,900 m), scoring only near-misses. 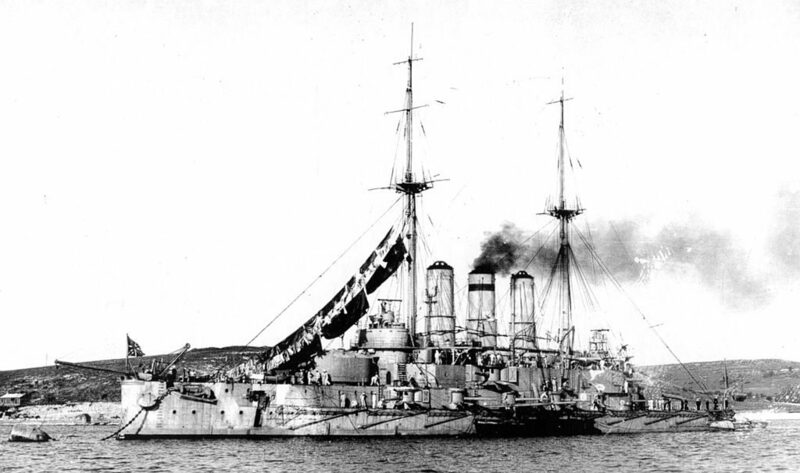 The Russian Admiral then decided “brake” to 5 knots (9.3 km/h; 5.8 mph), which leaved the Goeben at full speed unable to “cross the T” of the Russian line. After more turning manoeuvers, Tri Sviatitelia and Pantelimon rallied the line, and Pantelimon hit the Goeben twice. The German battlecruiser broke and fled but the slower Russians were unable to catch it. In 1915, the threat if air warfare was taken seriously and QF anti-aircraft guns were mounted on top of each of the turrets and screens on top of their funnels to avoid lucky bomb drops. Tertiary armament also varied from an addition of four 75-millimetre guns to two and two 63.5-millimetre (2.5 in) guns. After the dreadnought Imperatritsa Mariya entered service, both ships formed the 2nd Battleship Brigade. 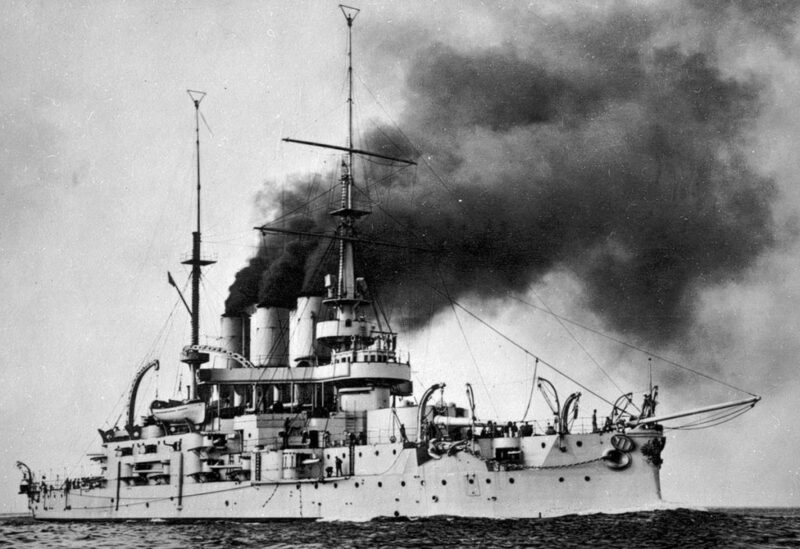 On November, the ships bombarded Zonguldak and Kozlu and later in May 1916 to the second bombardment of Varna. After the revolution started both ships has been mothballed and went into reserve in March 1918. In May, thy were both captured by the Germans in the context of civil war, and then passed on to the allies. The British inherited both ships in December, and after the situation went badly for the “whites”, their engines were wrecked in 22–24 April 1919. Eventually the Whites returned and the ships were recaptured in turn by the Bolsheviks in November 1920. Records shows both ships had been scrapped in 1922-23 but not stricken from the lists before 1925.